To embrace some new traditions I decided to start the new year with the Seasonal tree. In her book Mrs Sharp’s Traditions Sarah Ban Breathnach illustrates the use of the tree to celebrate the year and all it’s various traditions. Not just for Christmas but for Valentines, Easter, Summer Solstice, Autumn and Thanksgiving. 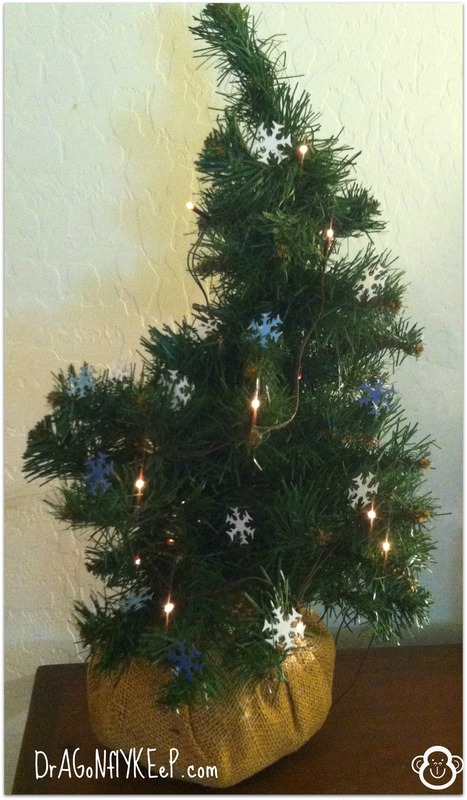 I found a “wintergreen” tree at my local thrift haunt and added miniature battery operated lights ($3.99 at a hobby store). With a snowflake punch I added a few snow flakes here and there. Nice way to continue to celebrate the winter season. Looking for some vintage inspired items for next month!!! Let the treasure hunt begin! That is brilliant!! I have a tree like this that I just put away because, well, it’s got Christmas decorations on it… may have to find some hearts to put on it for next month!! I am excited to start this. I am looking for some smallish decorative items for valentines. I think the tree should drip with pearls and roses for next month! !